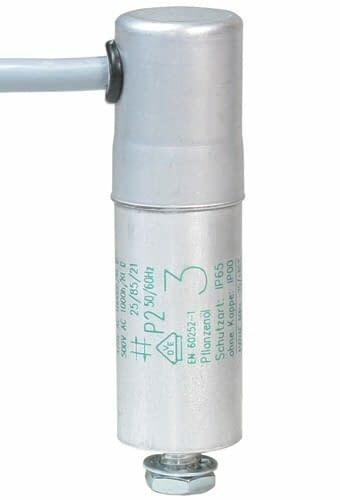 Motor capacitor with cable connection for the operation of AC motors with low performance like e.g. Roller-blind motors, fan motor. Capacitors are wear parts, which fail under extreme conditions or at reaching their lifetime. Hydra motor capacitors are manufactured with a build-in overpressure disconnector. In case of failure, the capacitor will expand in the axial direction up to about 9 mm. Due to the expansion, the thinner section of the fuse will break and the capacitor will be disconnected safely from the mains. Hydra capacitors are certified by the VDE Testing and Certification Institute and fulfill the regulations of safety class P2 according to EN 60252.